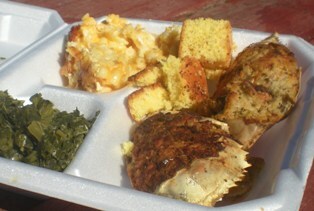 Gullah/Geechee Fishing Association Seafood Festival in St. Helena Island, SC. A perk of working with fishermen is of course getting a chance to taste some of the best seafood around. When I learned that the Gullah/Geechee Fishing Association would organize its very first annual seafood festival, I didn’t need to be convinced that it would feature the finest dishes in the Lowcountry. Held last Saturday in St. Helena Island, SC, the festival brought together visitors, neighbors, families, and friends for a celebration of good eating. The event was a fundraiser and membership drive for the newly founded organization. GGFA formed earlier this year as an outcome of meetings led by EDF and the Gullah/Geechee Sea Island Coalition to reach out to the African-American fishing community in the Southeast. Many within this community identify themselves as Gullah/Geechee, the descendents of West African enslaved people brought to the United States nearly 400 years ago. 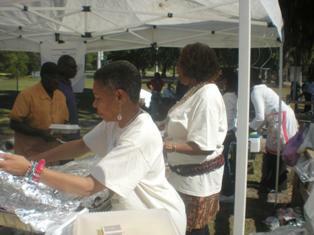 On Saturday, the air was flooded with the aroma of savory, traditional Gullah/Geechee seafood cuisine. Fried shrimp, whiting, flounder, oysters, deviled crab, steamed crab, shrimp and grits, and gumbo were only some of the dishes the association had to offer during the festivities. Members of the association supplied much of the seafood and served as chefs providing mouth watering fish hot off the stove. The food was nothing short of a feast. In an interview earlier last week, Queen Quet, head of the Gullah/Geechee Nation and secretary of GGFA, conveyed the cultural significance of the festival. According to Queen Quet, it is important to support GGFA because of its objective to passed down this customary knowledge to the next generation. For the Gullah/Geechee, fishing is an aspect of their culture worth honoring. It is a life skill that endured the African Diaspora and later helped to provide financial independence for the people. Thus ensuring healthy marine resources is an essential piece to protecting this “unbroken” tradition. Turnout for the event was strong, helping to raise enough money just shy of the association’s goal. In lieu of the successful festival, the GGFA is already looking into plans for next year. Congratulations to GGFA for putting on a great event. The level of hard work that went into it was evident throughout the joyous occasion and was reflected in the delectable dishes. Luckily for those who missed out, you have a year to work up an appetite for the next festival; I can promise you it will be worth the wait. 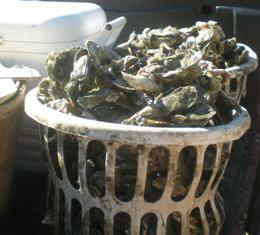 This entry was posted in Seafood and tagged Fishing, Gullah Geechee, Seafood, South Carolina. Bookmark the permalink. Both comments and trackbacks are currently closed. We look forward to more folks becoming GGFA supporters. Go to http://www.gullahgeecheefishingassociation.com to get in touch with us at any time. Tenki tenki fa cumin an hepin we!